On the CBC radio program Metro Morning on March 28, Toronto Mayor John Tory spoke about his concerns regarding Premier Doug Ford’s plans to upload the city’s subway system, as well as Ford’s intentions to build new subway extensions to Richmond Hill and Scarborough Centre, bury the Eglinton West LRT, and start the long-planned Relief Line. Instead of a conventional subway, the Relief Line envisioned by the province would use a “new technology,” despite planning and engineering underway for a subway, using an existing subway yard for Relief Line train storage. But Tory, who has been passive so far about the province’s plans, was hopeful that the unspecified new technology proposed for the Relief Line would be a “fantastic bonanza” for Toronto, but he added that he didn’t know for sure what would come of the new plan. Mayor Tory tells @metromorning he's prepared to hold out hope that the province's unspecified new tech for the Relief Line is a "fantastic bonanza for us. But I don't know." It is curious that Tory called this hostile takeover a “fantastic bonanza.” Bonanza was a long-running Western television show, starring Lorne Greene as the patriarch of the Cartwright family, owners of a vast ranch on Lake Tahoe. Bonanza was famous for its theme music and opening credits, which featured a burning map of the Cartwrights’ Ponderosa ranch before introducing the cast. Bonanza’s burning map is a great metaphor for Toronto’s transit planning. Newly elected mayors and premiers burn the maps left behind by their predecessors, and time is wasted on new feasibility studies and engineering reports, ready just in time for someone else to get elected with yet another idea. Plans come and go, but hardly anything ever gets built. There’s plenty of blame to go around. After a prolonged spurt of subway construction in the 1950s, 1960s and 1970s, momentum was lost. In the 1980s, Bill Davis’ Progressive Conservatives insisted on a novel linear-induction rail system for Scarborough, rather than the light rail project already underway. The Liberals, under David Peterson, proposed several subway lines, though it was scaled back under NDP Premier Bob Rae. In 1994, work started on the first phases of the Eglinton and Sheppard subways. When Mike Harris’ government was elected in 1995, they cancelled Eglinton, filling in a hole already dug for the tunnel boring machines. There was new hope in 2003, when a new Liberal provincial government was elected, and David Miller, an urban progressive, became mayor of Toronto. While the province’s top priority was the extension of the Spadina Subway to York University and Vaughan, it was willing to help fund major improvements to GO Transit, along with new light rail systems in Ottawa, Kitchener-Waterloo, Hamilton, and Mississauga-Brampton. It also committed to Miller’s proposed Transit City LRT network, including a fully grade-separated replacement of the ageing Scarborough RT. There were valid criticisms of Transit City — there were too many transfers to get around the top of the city, there was no Relief Line, and a few of the proposed lines, like parts of the Jane and Don Mills LRTs, were too difficult to build as surface rail projects. But because of Miller, the Eglinton-Crosstown LRT is well underway, and preliminary work continues on Finch Avenue West. Work would have also started on the Scarborough RT replacement and expansion and the Sheppard East LRT, had Rob Ford not been elected in 2010, promising “subways, subways, subways” and burning the transit maps for which new projects were planned and being built. Seven funded LRT stops in Scarborough became three unfunded subway stops. Overestimating Rob Ford, and hoping to keep seats in Scarborough, the Liberal government folded to his demands, and work stopped on the LRT replacement. Rob Ford’s disastrous term was followed by John Tory’s twin obsessions of SmartTrack and an austerity agenda, at a time when the Yonge and Bloor-Danforth subways were overwhelmed by demand caused by a growing population and a booming economy — hardly the conditions that demanded low spending on civic services and infrastructure and yet another half-baked transit plan. Tory promised that it would only take seven years to build SmartTrack, which would mostly use existing railway infrastructure, along with a new section of track in Etobicoke, on land already sold off for development. Tory’s insistence on SmartTrack further delayed momentum on the Relief Line. Though Tory remained committed to the Scarborough subway extension over the approved and funded LRT, it was reduced to a single stop as costs ballooned, while the subway and SmartTrack threatened to cannibalize each other. We don’t hear much about SmartTrack anymore, but at least Tory has come around on the Relief Line. But Doug Ford’s latest musings make it clear why the planned subway upload is so dangerous. So what now for the Relief Line? Despite the inevitable Simpsons monorail jokes (Doug Ford did promise a monorail on Toronto’s waterfront when he was a city councillor in 2011), the new technology the province is considering is likely an automated light metro line, similar to the Canada Line in Vancouver. The Canada Line links Vancouver’s city centre with the international airport and the suburb of Richmond. It was built as a private-public partnership (P3) project, in which a private company was contracted to design, build, and operate the line. It’s an attractive option for a conservative government: P3s promise to be cheaper to build and operate than a conventional public project. But the Canada Line has problems. Though trains are frequent, it was built too small to accommodate growth. The outer terminals at Vancouver airport and Richmond-Brighouse are both single track/single platform. Station platforms are too short — only 40 metres long — to increase train sizes. And as many stations are underground, it’s too expensive to extending platforms to fit larger trains. Some relief is coming, but even then, the maximum capacity of the Canada line is 15,000 persons per direction per hour, far less than Vancouver’s SkyTrain lines or Toronto’s subway. If this is the route Toronto takes, it won’t be long before the Relief Line itself will need relief. Once again, I fear that Toronto will continue to spin its wheels thanks to the Ford circus. And it’s a shame — though sadly not surprising — that Mayor Tory isn’t fighting back. In 1891, the Toronto Railway Company (TRC) was created, taking over the city’s streetcar system from its predecessor, the Toronto Street Railway. The TRC quickly began electrifying Toronto’s transit network, operating fifteen routes across the city. Electric streetcars were faster than horse-drawn trams, and passengers had difficulties figuring out which streetcar was theirs at night. Under this scheme, the Yonge Streetcar could be identified by one blue light, while the Broadview Streetcar could be identified with red and green lights. This system required passengers to memorize their route’s colours, and as new routes were introduced, changed, or withdrawn, it became cumbersome. Eventually, lighting technology caught up: while back-lit destination signs were possible by 1910, the TRC became hesitant to spend any capital funds to modernize its fleet or expand the streetcar railway network. The City of Toronto was forced to start its own streetcar system, the Toronto Civic Railway, to serve outlying neighbourhoods. Though the Ontario Railway Board (predecessor to the Ontario Municipal Board) refused to force the TRC to expand the street railway network beyond the 1891 boundaries, it ordered the TRC to install backlit route signs. These new signs were introduced in February 1913, and those unique coloured bulbs disappeared by 1915. Six years later, the TRC’s franchise was up, and the city-owned Toronto Transportation Commission came into being. In 1935, the TTC re-introduced “bull’s eyes” to its streetcar fleet. Officially known as an advance light, a single roof-mounted light, which gave off a blue-green hue, was designed to let waiting passengers know a streetcar was on its way. At the same time, the TTC installed dash lights, which both illuminated advertising cards and provided additional lighting, a useful safety feature. New PCC streetcars, which began arriving in 1938, were built with the advance lights already installed. By 1940, all streetcars, including the remaining wooden cars acquired from the Toronto Railway Company, were equipped with advance lights. After the Second World War, PCC streetcars purchased from cities such as Cincinnati, St. Louis, and Kansas City, were similarly fitted with the roof-mounted lamps. CLRV streetcar on Queen Street East, with two blue-green advance lights above the back-lit destination sign. By the 1970s, the TTC decided to maintain its street railway fleet after planning for their eventual replacement with buses and subways, and sought a replacement fleet for its ageing PCCs. The new Canadian Light Rail Vehicles (CLRVs) and Articulated Light Rail Vehicles (ALRVs) were designed with dual advance lamps, mounted within the streetcar body, immediately above the destination sign. Advance lights were introduced to TTC buses starting in the mid-1990s, as new wheelchair-accessible vehicles were added to the fleet, starting with high-floor Orion V and Nova RTS buses, and continuing with newer low-floor vehicles. Blue lights indicated that the bus was accessible. As a bonus, when combined with new digital orange LED destination signs, the bus advance lights served to further improve the visibility of approaching transit vehicles. The new Bombardier Flexity streetcars are similarly equipped with new blue LED lights, as they too are fully accessible vehicles. While blue advance lights are unique to TTC buses, the new light rail vehicles for Waterloo Region’s ION LRT, also built by Bombardier, sport similar blue lights. Earlier this year, I took a ride on Wroute, a new service connecting Guelph, Kitchener, and Burlington that has some characteristics of a bus service, a taxi company, and ride-hailing app. With a fleet of Tesla Model X electric SUVs, Wroute tries fill a gap left by GO Transit and other intercity transportation operators in the Guelph-Kitchener/Waterloo-Hamilton Triangle. It’s an interesting concept, but it is not enough to move commuters quickly, reliably, frequently and, most important, affordably. I spoke with two Kitchener residents — James Bow, author and webmaster of Transit Toronto, and Brian Doucet, Canada Research Chair in cities planning at the University of Waterloo — to find out what the region really needs. You can read the full article at the TVO website here. In February 2018, Duncan Xu, an 11-year old boy, was struck and killed crossing a residential street in North Scarborough on his way home from school. He was one of forty-two pedestrians unintentionally struck and killed by motorists in Toronto last year. Not long after Duncan’s death, I visited the neighbourhood and wrote about the tragedy. Canongate Trail, where Duncan was struck, is a two-lane residential street. At the time, there were no traffic calming measures in place to slow down motorists, many of whom used Canongate as a shortcut around the busy intersection of Kennedy Road and Steeles Avenue. The local councillor, Jim Karygiannis, decided to unilaterally close a walkway linking the rear schoolyard with Canongate Trail, close to where Duncan was killed. Duncan used the walkway before he tried to cross the street. Since then, more permanent fixes were made. At the request of Karygiannis and local residents, city staff studied both reducing speed limit and installing traffic calming measures. While staff recommended reducing the speed limit to 30 kilometres an hour, they concluded that traffic calming measures such as speed humps were unwarranted. The speed humps were added anyway, along with other measures. A new all-way stop was added at Ockwell Manor Drive, near where the walkway meets the Canongate Trail sidewalk. Beyond the point where the walkway meets the sidewalk, fencing was installed to discourage children from running into the street. These are significant improvements. Still, more can always be done. Curb extensions or bulb-outs at intersections would be another effective traffic calming measure, narrowing the roadway, slowing down turning vehicles, and increasing pedestrian visibility while reducing pedestrian crossing distances. What’s most disheartening though is that it took a young child’s death for these measures to happen. All residential streets should have a 30 km/h limit and streets designed to slow motorists down, including measures such as curb extensions and speed humps. As with the “Slow Down – Kids at Play” lawn sign campaign, action only comes after a high-profile tragedy. Even then, it’s not enough. It’s good to see progress on Canongate Trail. But this should be the standard everywhere. We can and should do better in Toronto if we are all serious about implementing a true Vision Zero policy. It’s budget time for most municipalities in Ontario. Unlike cities elsewhere in the world — where municipalities can levy income, sales, and payroll taxes — places like Toronto, Ottawa, and Brampton rely on property taxes for most of their operating revenue, and they are complicated. Toronto homeowners enjoy the cheapest property tax rates in the Greater Toronto Area, too low in fact to properly support city services like transit, housing, or adequate snow clearance. Meanwhile, Brampton has some of the highest property tax rates in the city. A typical house in Brampton whose assessed value is $800,000 would be levied $8,284.73 in property taxes in Brampton. A similar house in suburban Scarborough or Etobicoke might be worth more, but the taxes on a house accessed at $1 million would be just $6,355.10. While freezing property taxes might be popular, it isn’t a sustainable solution to high property taxes. A property tax freeze means that the city will not collect any additional tax revenue, regardless of new development or higher property assessments; unlike income and sales taxes, property tax revenue does not grow with the economy. Commercial and industrial property tax rates are higher, but Brampton doesn’t have enough of either land use compared to housing. Brampton’s property tax issues are structural; tax cuts or freezes will not help. Having a diverse tax base, like Toronto’s, is a better solution, but it won’t be easy. I explain more in Bramptonist. In 1967, GO Transit launched a new rail service between Pickering and Hamilton. The new commuter train service was made possible as GO just built a new freight bypass so its trains could avoid Downtown Toronto and connect to a new sorting yard in Vaughan. Today, trains on the Lakeshore Line operate as frequently as every fifteen minutes during weekdays, and every half hour on weekends. Unfortunately for Brampton, that freight bypass built in the 1960s runs right through its downtown core, limiting the number of passenger trains that can serve Brampton, Guelph, and Kitchener. Last December, the provincial government cancelled plans for a new freight bypass that would have diverted CN trains from a critical section of track in Brampton, allowing for frequent GO and intercity services. Around the same time, a new GO Transit schedule resulted in extreme overcrowding and extended delays on the Kitchener Line. As population and ridership grows, there are few answers and little promise of relief that the freight bypass would have provided. In my debut article for Bramptonist, I comment on the future of the Kitchener Line, the only GO line serving Ontario’s fourth largest city and an important commuter link to Guelph and Kitchener-Waterloo. What can Brampton expect now that the freight bypass is dead? 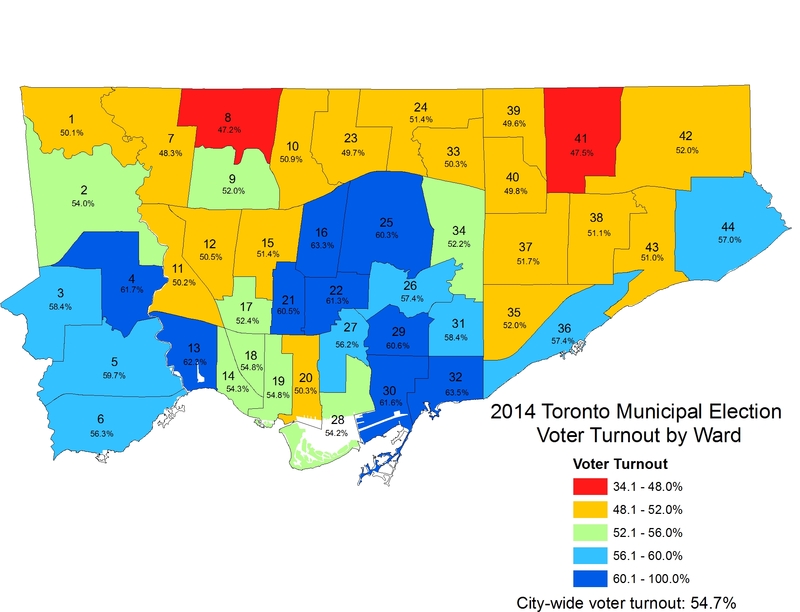 2014 was a watershed year for municipal voter turnout in Toronto. After a disastrous four years of Rob Ford as mayor, 54.7 percent of all eligible voters went to the polls, electing John Tory. That was the highest voter turnout in decades, even higher than 1997, when Torontonians elected Mel Lastman to lead a newly amalgamated City of Toronto. In 2010, when Rob Ford was elected mayor, turnout was 50.4 percent, compared to 39.3 percent in 2006 and 38.3 percent in 2000. Four years ago, the mayoral race was especially competitive. Progressive Olivia Chow was the initial front-runner against Ford, but Tory (who previously ran for mayor in 2003) pulled ahead as Chow’s campaign floundered. Late in the campaign, Rob Ford dropped out due to health concerns, so his brother Doug took his place. Among the three frontrunners, Tory got 40.3 percent of the vote, while Doug Ford took 33.7 percent. Chow only got 23.1 percent. Voters also elected seven new councillors that year, and returned Rob Ford to Ward 2. After two elections in which over half the number of eligible voters took part, in 2018 voter turnout fell to just 40.9 percent. This was hardly surprising. John Tory cruised to victory despite a challenge by former chief planner Jennifer Keesmaat, while a sudden reduction in the number of wards confused voters and crushed the hopes of many council hopefuls and their supporters. Though 769,000 electors voted in this mess of an election, voter turnout varied across the city. In Ward 23, Scarborough North, only 34.1 percent of eligible voters turned out to the polls. In Ward 7, Humber River-Black Creek, just 34.6 percent of electors voted. Ward 10, Spadina-Fort York, had the third worst turnout, with just 34.8 percent. 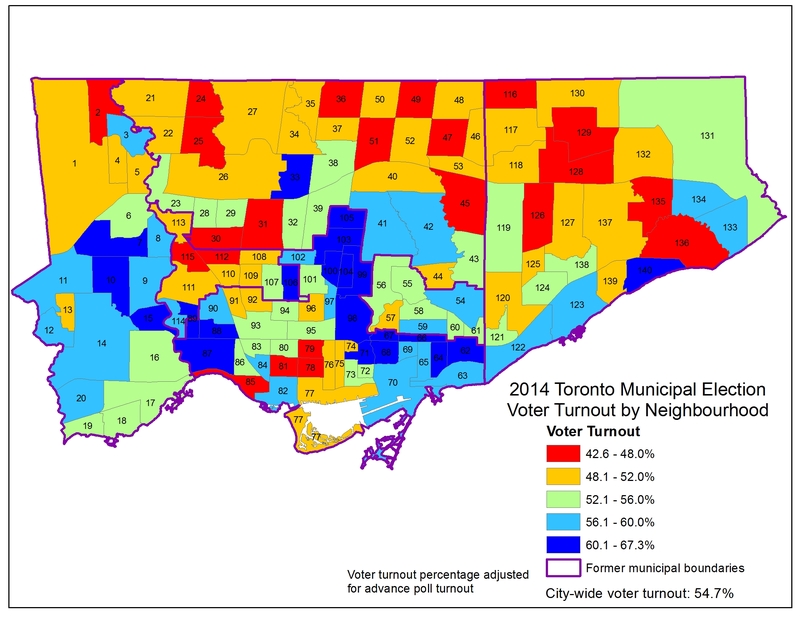 Areas with the highest voter turnout were Midtown and east end Toronto. Ward 14, Toronto-Danforth had the highest turnout, where 49.2 percent of electors cast a vote. It was followed by Ward 15 and Ward 12 (both of which had 48.5 percent turnout) and Ward 19, where 48.4 percent of electors went to the polls. Wards 12, 14, 15, and 19 had interesting and competitive council races. In Ward 14, the race featured two progressive incumbents, while Ward 19 was one of just two races in which an established city councillor was not running for re-election. Wards 12 and 15 also had competitive races. However, in Ward 4, Gord Perks won re-election easily. Yet Ward 23 had an open council race in which no incumbent was running. And Ward 7 was one of the most interesting and important races of 2018; this is where Giorgio Mammoliti was finally defeated after years of campaign violations, buffoonery, and embarrassments. Voter turnout has consistently been low in Toronto’s northwest and northeast corners. In 2014, Ward 8 and Ward 41 (which made up parts of new Wards 7 and 23) had the lowest numbers of electors casting a vote. 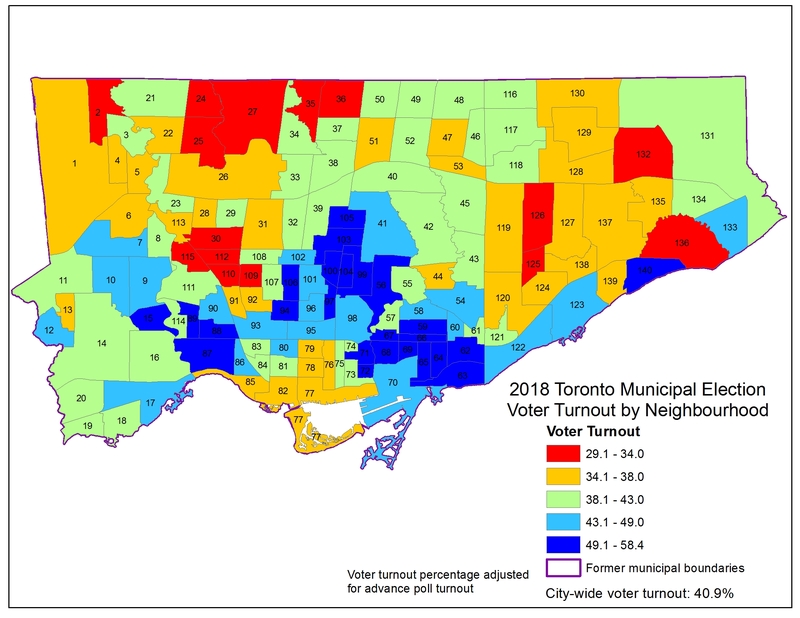 Turnout was highest in more affluent neighbourhoods, especially in places like Midtown Toronto, the Kingsway neighbourhood in Etobicoke, and in Toronto’s East End. What surprised me mostly was the poor turnout in Ward 10 in 2018. The difference in voter turnout across the city is more apparent at the neighbourhood level. With the poll-level results available through Toronto’s Open Data Catalogue, I allocated the poll results to each of Toronto’s 140 neighbourhoods, while adjusting the numbers based on the number of votes cast in the advance polls in each ward. The map below shows voter turnout at the neighbourhood level in 2018. What is immediately apparent is that voter turnout is highest in many neighbourhoods surrounding Toronto’s downtown core, while turnout is lowest in the former City of York, in northwestern Toronto and parts of Scarborough. Areas of high voter turnout tend to be affluent neighbourhoods with high levels of home ownership. These neighbourhoods include the Kingsway, Lawrence Park, Leaside, Cabbagetown, Rosedale, Forest Hill, Swansea, the Beaches, and Leaside. Many of these areas also have active residents’ associations. 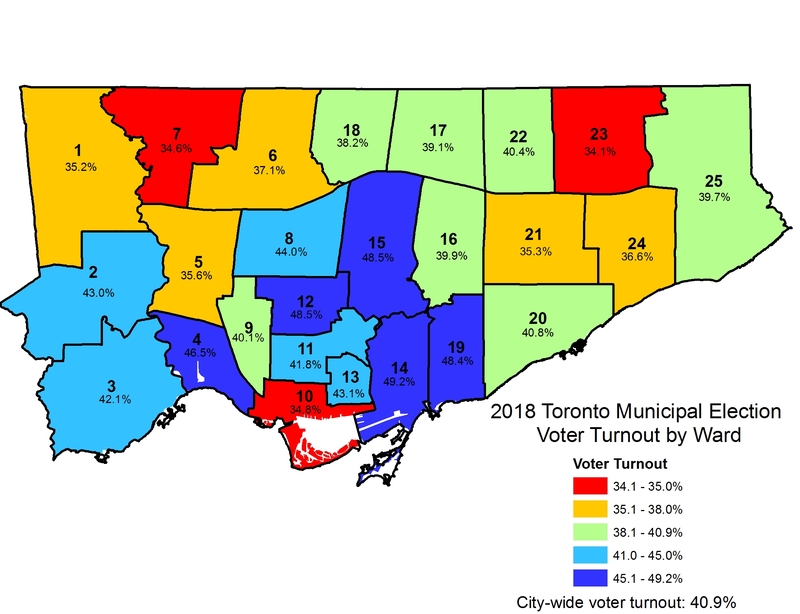 With Ryerson professor Myer Siemiatycki, I looked at the results of previous municipal election voter turnouts in a report published by the Maytree Foundation. Downtown, areas with major condominium developments also have lower turnout, especially in places like the Waterfront, CityPlace, Liberty Village, and the Bay Street corridor. These areas are more likely to have younger residents and many renters. Engaging voters both in downtown condos and those living in the inner suburbs remains a challenge. While voter turnout was much higher in 2014 across the city, the same basic patterns are evident.